If you want to keep your grazing horse near your campsite, within your vision and hearing, hobbles work well. These old-fashioned devices still work well today, limiting your ride's range without actually tying him up. 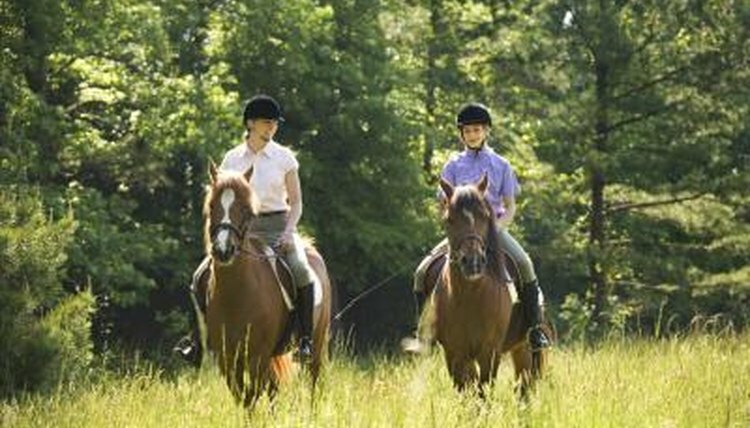 Campers on multi-day trail rides, for example, can allow their horses grazing time at the end of the day without worrying about the mounts wandering off or getting lost. The type of hobble that works best for you depends on your horse's training and temperament. One of the most common locations to hobble a horse is at his pastern, the area between the hoof and the fetlock joint. The hobbles need to be in the same location on both legs and secured so that they do not slip or slide around on the leg. If you are using a three-way hobble, including a rear leg as well, all three hobbles should be evenly placed. Front-leg hobbles can be attached above the pasterns on either the cannon bones or completely above the knee. Attaching the hobbles to a higher location on the leg may further limit the horse's ability to wander by restricting the length of his strides even more. This placement also has the benefit of limiting the extent of chafing when the horse moves. You fasten the same style of hobbles on the upper leg as you do on the pastern. Simply adjust the buckles so that the hobbles fit snugly on the area of the leg where you wish to use them. Horses can have both front legs hobbled together or you can use a longer hobble to attach one front leg to the rear leg on the same side. This style of hobbling is called a sideline. An Australian hobble attaches a front leg to the hind leg on the opposite side. Nursing hobbles placed on the hind legs prevent a mare from kicking at her foal. Nursing hobbles can also be used to restrain and discourage misbehavior by horses who kick aggressively. Hobbles should be adjusted so that they are snug on your horse's leg without hindering the circulation, cutting into the skin or otherwise causing unnecessary discomfort to the animal. Your horse should not have all four legs hobbled at once. Humane hobbles are made of leather or rope. Do not use chain hobbles under any circumstances. These dangerous devices can cause considerable damage or pain to your horse.